← It’s Time To Sign Up For The 8th Annual 5K Walk/Run! Special Thanks to West Hawaii Today! 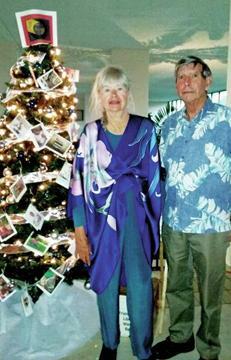 Friends of the Library — Waikoloa Region (FLWR) won third place prize in the Mauna Lani Charity Trees competition in late December. The theme of the entry was “Baby’s First Book.” Members Vivian Green and Steve Jarvis helped decorate the tree. First place went to VFW Auxiliary and second place to Waimea Arts Council.